With the profound impact that technology has transformed various industries right from agriculture to the future of connected devices has been a fundamental shift in the structure of our global society. However, with digital divide glaring at communities living in low-income areas in East Africa region it has hindered many residents from leveraging on the access and usage of ICTs for socio-economic empowerment. This has resulted in pushing the youth slowly away from job opportunities that are presented in the current digital age. In Kenya for instance, the Ministry of Public Service, Youth, and Gender Affairs estimate that the unemployment rate among youth is estimated at around 80 percent with 90 percent of them lacking vocational training. This damning report projects a big divide and demonstrates just how much more needs to be done, especially with the regions booming tech industry combined with a large number of young people who want skills. However, there have been several initiatives taken by the government, private sector, and civil society to improve digital literacy skills for youth, especially those in remote areas. One of the largest such training programs is the Ajira Digital Programme facilitated by the national government’s Ministry of Information Communications and Telecommunications back in 2016 with the aim of training 1 million youth to be digitally literate and improve their employment likelihood. These shortcomings have also resulted in the development of more social-centric initiatives, one such organization is Tunapanda institute, whose goal is to build a digital ecosystem in education enabling community members to leverage on connectivity for sustainable livelihoods. The institute, started 6 years ago by Jay Larson and Mick Larson, two global nomadic brothers from the United States offers free training programs for students between the ages of 18 to 30 in information and communications technologies (ICTs), design, and business as it is creating an alternative path for people to develop valuable skills and flourish to become teachers and professionals. In East Africa, there is a big problem of youth unemployment and a severe shortage of teachers – especially in fields related to technology; since teachers with tech skills are in high demand from the private sector. “This greatly contributes to wasted potential and sustained inter-generational poverty. Tunapanda institute seeks to empower residents of the city’s largest slum with the skills and equipment to qualify for entry-level jobs in the tech market by shrinking the digital divide,” Brian Mwevi, the institutes’ partnership’s lead, Kibera Aeronautics, and Space Academy (KASA) notes. The institute has set up a training facility in Kibera, Nairobi’s largest informal settlement, to test a new model of peer-to-peer learning and teacher training. 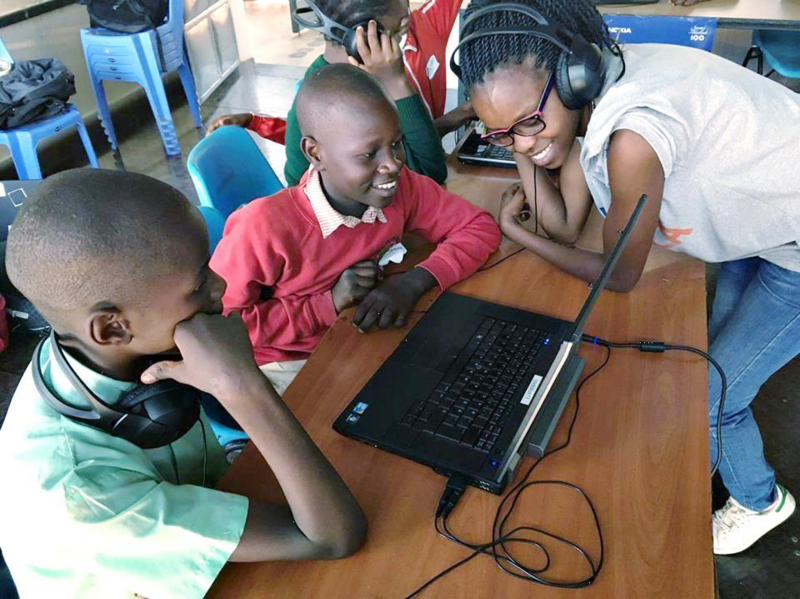 The network, conceptualized in 2015, aims at providing youth in Kibera with access to digital educational content. It currently accommodates around 30 trainees per cohort as it receives over 300 applications. “The idea was to have local youth access Tunapanda’s eLearning platform (SWAG) and take online courses, should they not be successful in their application to join the program,” Mwevi says. “In the past year, dozens of young people from around East Africa have, through our intensive 3-month programs, taken steps that yield not only great jobs – but also more enthusiasm for life and personal confidence in tackling local problems with global implications,” according to the organization’s website. The team is now focused on launching a new program, which will create an initial 9 micro-courses and test them with young people through their partners in Kibera, before releasing them for free to the public to help tackle real-world problems. “KASA will be a learning centre in Kibera that will be run by local graduates of Tunapanda Institute’s 3-month training program acting as a hub for space exploration and STEM education,” he says. Of the institute’s graduates, 75 percent have found employment through the institute’s placement assistance. The institute works with partners around East Africa to spread learning through open source software and locally-created open learning resources. “The model has applications around the world, and we are deploying initially in lowest-income parts of less-developed countries. Check out our video, above, to learn more,” Mwevi says. Through a partnership with the Internet Society, International Centre of Theoretical Physics (Italy) and Rhinotivity (Denmark), four nodes were deployed in 2017 serving two schools with over 1500 students and a youth centre serving 300 local youths. According to Dennis Lighare, one of the beneficiaries of the program from 2016, the institute is creating a model that can be replicated globally – in both less-developed and most-developed countries. The software being created is open source and the educational resources (including videos and interactive learning tools) made are openly-licensed. The institute is in the process of developing a larger, school-based initiative to provide access to digital literacy and economic opportunity. At least 300 schools in Kibera will be given Internet access and devices, and connected by a common sharing network. Teachers and school administrators will be trained to understand and communicate the value of ICTs to their students as well as integrate them into their learning models. The community network connecting the slum’s 300 schools is still in its early stages. “Tunapanda also provides other services such as market research, web development and corporate training, which allows the organization to provide free, offline, open-source educative materials, and to run their digital literacy training free of cost,” Lighare indicates. Tunapanda’s projects have progressed relatively slowly, as they have an entirely volunteer workforce and must devote a lot of time and energy to fundraising. Tech Dada, an initiative within the Institute, seeks to provide girls and young women with adequate mind-sets and required skills for them to successfully carry out the opportunities in 21st Century is one of the success stories from Tunapanda. “Tech Dada envisions many East African young women pursuing careers in technology, design & business as they put their emphasis on solving real world problems both locally and globally. To achieve this, they have come up with a curriculum and various courses that increase the awareness of tech opportunities and they have community outreach programs which engages with local organizations and institutions, such as schools and non-profit organizations,” Says Renice, a graduate from the 4th cohort and one of the Tech Dada trainers. Tunapanda Institute is actively partnering with organizations as well as looking for funding to replicate their projects. One such project is currently in development in Kawangware, a smaller slum in Nairobi. Another project is running in Kakuma, a refugee camp in northern Kenya. Looking into the future, Tunapanda’s eventual success involving prioritizing community outreach and collaboration is a major element of their development and deployment. Tunapanda’s work has determined that the Internet has potential in Africa, but without robust local content, infrastructural development alone will likely not have the desired impact. When locking the door is not enough.